H.P. Blavatsky (1831-1891) was the first person in modern times to claim contact with the Theosophical Adepts, especially the Masters Morya and Koot Hoomi. She also affirmed that in her writings she was giving out the teachings of the Adept Brotherhood. There has been a great deal of controversy concerning the existence or non-existence of these particular Adepts. Mme. Blavatsky's critics have usually doubted the reality of her Masters. But it is a historical fact that more than twenty five individuals testified to having seen and been in contact with these Mahatmas during H.P.Blavatsky's lifetime. For a detailed chronological listing of these testimonies, see A Casebook of Encounters with the Theosophical Mahatmas. (2) Colonel Olcott's eyewitness testimony describing eight of his meetings and encounters with the Master Morya. The meetings are given in chronological order. For more relevant information, see footnote 2 below. ...About two months ago, I sent you from Ceylon a letter respecting my personal knowledge of the so-called "Himalayan Brothers," [the Masters or Mahatmas] which has not yet been published in your columns. It was called forth by your editorial remark that I have not given testimony to the fact of their existence; and the necessary implication that my silence was due to disbelief in the same, or at least to lack of proof sufficient to make me willing to so commit myself. Pray allow me to set the question at rest, once for all. I have seen them, not once but numerous times. I have talked to them. I was not entranced, nor mediumistic, nor hallucinated, but always in my sober senses. I have corresponded with them, receiving their letters....I have seen them, both in their bodies and their doubles, usually the latter..... Since November last, four different Brothers have made themselves visible to visitors at our head quarters. Source: "The Himalayan Brothers," Light (London), March 4, 1882, p. 98. ...Throughout my studies I have tried to obtain my proofs in a valid form. I have known mesmerism for a quarter of a century or more, and make every allowance for self-deception and external mental impressions. What I have seen and experienced is, therefore, very satisfactory to myself, though mainly valueless to others. One evening, at New York, after bidding H. P. B. good night, I sat in my bed-room, finishing a cigar and thinking. Suddenly there stood my Chohan ["Lord", Guru, i.e., Master Morya] beside me. The door had made no noise in opening, if it had been opened, but at any rate there he was. He sat down and conversed with me in subdued tones for some time, and as he seemed in an excellent humour towards me, I asked him a favour. I said I wanted some tangible proof that he had actually been there, and that I had not been seeing a mere illusion or maya conjured up by H. P. B. He laughed, unwound the embroidered Indian cotton fehta [turban] he wore on his head, flung it to me, and --- was gone. That cloth I still possess, and it bears in one corner the initials . . . of my Chohan in thread-work. This at least was no hallucination. . . . Source: Olcott, Henry S. Letter from Col. Olcott to Mr. H----- X -----. This letter (dated Sept. 30, 1881) from Henry S. Olcott to Allan O. Hume about the Mahatmas was first published in A.O. Hume's Hints on Esoteric Theosophy, No. 1, 1882, pp. 76-86. ...And as the light gradually dawned on my mind, my reverence for the unseen teachers [the Mahatmas] who had instructed her [Mme. H.P. Blavatsky] grew apace. At the same time, a deep and insatiable yearning possessed me to seek their society, or, at least, to take up my residence in a land [India] which their presence glorified, and incorporate myself with a people whom their greatness ennobled. The time came when I was blessed with a visit from one of these Mahatmas in my own room at New York - a visit from him, not in the physical body, but in the "double," or Mayavi-rupa. When I asked him to leave me some tangible evidence that I had not been the dupe of a vision, but that he had indeed been there, he removed from his head the puggri [turban] he wore, and giving it to me, vanished from my sight. That cloth I have still, and in one corner is marked in thread the cipher or signature he always attaches to the notes he writes to myself and others. Source: Olcott, Henry S. On Madame Blavatsky and the Mahatmas. An extract from Olcott's lecture titled "Theosophy, the Scientific Basis of Religion," delivered at the Town Hall, Calcutta, India, April 5, 1882. Reprinted from Olcott's Theosophy, Religion and Occult Science, London, George Redway, 1885, pp. 121-124. MR. MYERS: Was the Hindu you saw in New York indisputably the same as you subsequently saw in India? MR. MYERS: And whom you saw in the astral body? MR. STACK: He suddenly appeared? MR. MYERS: How tall was the Hindu who appeared to you in New York? COLONEL OLCOTT: He was a model of physical beauty, about 6ft. 6in. or 7in. in height, and symmetrically proportioned. MR. MYERS: That is a very unusual height, and is in itself a tolerable identification. COLONEL OLCOTT: Great stature is not so rare among the Rajpoots [of India]. MR. MYERS: I presume that you were impressed by his height in New York? MR. MYERS: Have you seen other Hindus of that height? Source: Olcott, Henry S. Henry S. Olcott's Deposition to the Society for Psychical Research, 1884. Reprinted from the First Report of the Committee of the Society for Psychical Research, Appointed to Investigate the Evidence for Marvellous Phenomena offered by Certain Members of the Theosophical Society, Appendix I, pp. 34-62, London, 1884. I was quietly reading, with all my attention centered on my book. Nothing in the evening's incidents had prepared me for seeing an adept in his astral body; I had not wished for it, tried to conjure it up in my fancy, nor in the least expected it. All at once, as I read with my shoulder a little turned from the door, there came a gleam of something white in the right-hand corner of my right eye; I turned my head, dropped my book in astonishment, and saw towering above me in his great stature an Oriental clad in white garments, and wearing a head cloth or turban of amber-striped fabric, hand-embroidered in yellow floss silk. Long raven hair hung from under his turban to the shoulders; his black beard, parted vertically on the chin in the Rajput fashion, was twisted up at the ends and carried over the ears; his eyes were alive with soul fire, eyes which were at once benignant and piercing in glance....He was so grand a man, so imbued with the majesty of moral strength, so luminously spiritual, so evidently above average humanity, that I felt abashed in his presence, and bowed my head and bent my knee as one does before a god or a godlike personage. A hand was lightly laid on my head, a sweet though strong voice bade me be seated, and when I raised my eyes, the Presence was seated in the other chair beyond the table. At last he rose, I wondering at his great height and observing the sort of splendor in his countenance --- not an external shining, but the soft gleam, as it were, of an inner light --- that of the spirit. Suddenly the thought came into my mind: "What if this be but hallucination; what if H.P.B. has cast a hypnotic glamour over me? I wish I had some tangible object to prove to me that he has really been here, something that I might handle after he is gone!" The Master smiled kindly as if reading my thought, untwisted the fehta [turban] from his head, benignantly saluted me in farewell and --- was gone: his chair was empty; I was alone with my emotions! Not quite alone, though, for on the table lay the embroidered head cloth, a tangible and enduring proof that I had not been "overlooked," or psychically befooled, but had been face to face with one of the Elder Brothers of Humanity. Source: Olcott, Henry S. Unpublished Diaries. Entry for July 15, 1879, Bombay, India. ...This . . . Brother [Morya] once visited me in the flesh at Bombay, coming in full day light, and on horseback. He had me called by a servant into the front room of H. P.B.s bungalow (she being at the time in the other bungalow talking with those who were there). ...MR. MYERS: We want now an account of seeing your Teacher in the flesh. MR. MYERS: How do you know that your Teacher was in actual flesh and blood on that occasion? COLONEL OLCOTT: He put his hand upon my head, and his hand was perfectly substantial; and he had altogether the appearance of an ordinary living person. When he walked about the floor there was noise of his footsteps, which is not the case with the double or phantasm. MR. MYERS: Do you conceive that he had travelled to Bombay in the ordinary way? COLONEL OLCOTT: He was then stopping at a bungalow, not far from Bombay, belonging to a person connected with this brotherhood of the Mahatmas, and used by Mahatmas who may be passing through Bombay on business connected with their order. He came to our place on horseback. MR. STACK: Was he on that occasion dressed the same as in New York? COLONEL OLCOTT: Yes. They wear ordinarily, when away from Thibet, a dress of white cotton --- in fact, that is the common dress of Hindus. MR. MYERS: Was that the only occasion on which you have seen him in the flesh? COLONEL OLCOTT: No; I have seen him at other times. MR. MYERS: Have you seen him three or four times in the flesh? COLONEL OLCOTT: Yes, more than that, but not under circumstances where it would be evidence to others. MR. MYERS: And about how many times in the astral body? COLONEL OLCOTT: Oh, at least 15 or 20 times. MR. MYERS: And his appearance on all those occasions has been quite unmistakable? ...M [orya was] here this evening & wrote to Fauvety of Paris. He says 5000 English troops killed in Afghanistan in the recent battle. . . . Source: Olcott, Henry S. Unpublished Diaries. Entry for August 4, 1880, Bombay, India. ....On the evening of 4th August , a Mahatma [Master Morya] visited HPB, and I was called in to see him before he left. 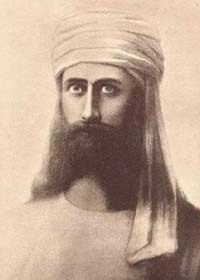 He dictated a long and important letter to an influential friend of ours at Paris, and gave me important hints about the management of current [Theosophical] Society affairs. Source: Olcott, Henry S. Old Diary Leaves: The Only Authentic History of the Theosophical Society. London: Theosophical Publishing Society, 1900. Vol. 2 (18781883), p. 208. Source: Olcott, Henry S. Unpublished Diaries. Entry for January 28, 1882, Bombay, India. ...[I had a] night visit from M[orya] who directed telegram to be sent to A[llan] H[ume] about Fern's visions. . . .
. . . In night [I] had visit from M[orya] and Majji. . . . Source: Olcott, Henry S. Unpublished Diaries. Entry for Sept. 25, 1885, Gooty, India.
. . . that night [at Gooty] I was visited by my Guru [Morya] and 'Majji'. . . . Source: Olcott, Henry S. Letter dated October 10, 1885 from Henry S. Olcott to Francesca Arundale. The Theosophist (Adyar, Madras, India), December 1932, p. 275. Source: Olcott, Henry S. Unpublished Diaries. Entry for October 25, 1888. ...[I had] the most unexpected and splendid visit from M[orya] in the train. I felt so rejoiced I could almost have jumped out of the window. He was so kind, so loving and compassionate; despite all my faults and shortcomings, he bears with me and holds to me because of the useful work I have now and then done, and of my fervent desire to do my duty. If he has not told you already, he will; so I shall not flog my tired brain to describe how he came, talked, looked and went. Goodnight, Chum -- to you and to all . . . .
(1) Henry Steel Olcott (1831-1907) was an American Theosophist, journalist, editor, attorney, and co-founder/first president of The Theosophical Society (founded 1875). Olcott was associate agricultural editor (1859-1861) of the New York Tribune. He served in the American Civil War and was appointed Special Commissioner (1862-66) in the U.S. War and Navy Departments to investigate corruption and fraud in military arsenals and navy yards. Colonel Olcott also practiced law in New York City from 1868 to 1878. While investigating Spiritualistic phenomena at Chittenden, Vermont in October, 1874, he met Madame Blavatsky. 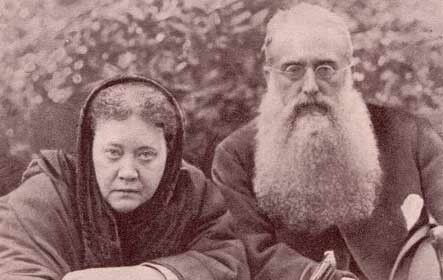 They became close friends and associates and were two of the principal founders of the Theosophical Society. As first President of The Theosophical Society (an office he held for the rest of his life), Colonel Olcott worked tirelessly on behalf of the Society, traveling throughout India, southern Asia, Australia, Europe and elsewhere.  The White Buddhist: The Asian Odyssey of Henry Steel Olcott by Stephen Prothero, Bloomington, Indiana, Indiana University Press, 1996.